1 Rinse cherry tomatoes and pierce the skin several times with a toothpick. 2 Rinse and dry cabbage, cuut crosswise into quarters and then lengthwise into strips. 3 Rinse the lemon half in hot water, wipe dry and finely grate zest. Squeeze juice. 4 Rinse salmon and pat dry with paper towels. Cut into bite-sized chunks. Combine with a little lemon juice and season with salt and pepper. 5 Cook the tagliatelle in a pot of boiling salted water until al dente according to package directions. 6 Meanwhile, in a large pot, mix coffee creamer with lemon zest and cream cheese until smooth. Season with salt and pepper. Heat mixture over medium high heat. 7 Add cabbage and cook over medium heat until tender, about 8 minutes. Add the tomatoes and salmon pieces and cook until fish is opaque, about 6 minutes. 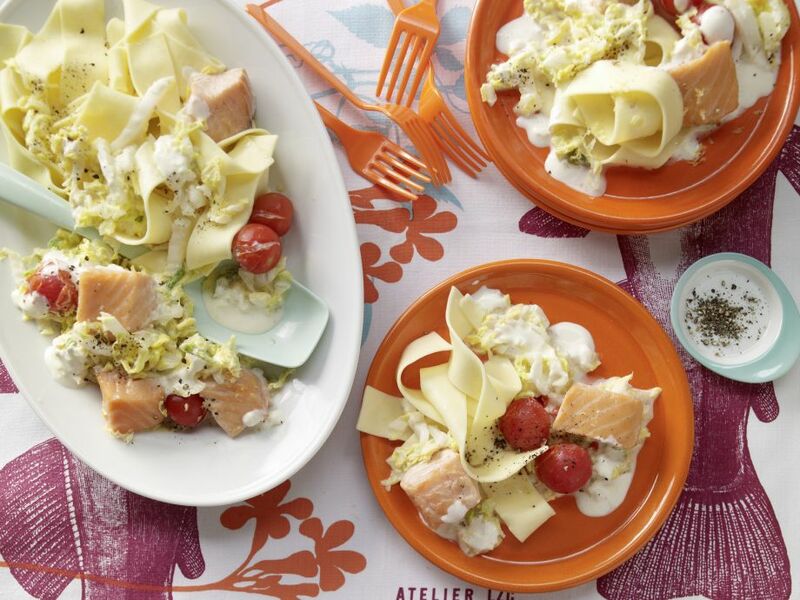 Drain the pasta and serve alongside the salmon and vegetables.